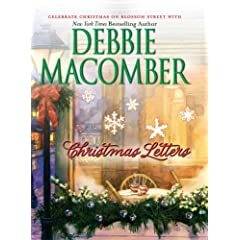 This is the second Debbie Macomber book that I've read on my Twelve Days of Christmas Challenge. The first one was sorely disappointing. This one was only marginally better. I think this may be the last book that I read by Debbie Macomber. This is really surprising because Macomber is a very popular writer that has graced the bestseller list more than once. Her books are promoted as heartwarming books, but I found them flat. In Christmas Letters, Katherine O'Connor writes Christmas letters for extra money, which I thought was an interesting concept. She spends her days in a cozy cafe and one day she meets Dr. Wynn, a child psychologist who doesn't believe that children should believe in Santa Claus. This creates some tension between Katherine and Wynn, but they find a definite attraction to each other. What I think the two books that I've read lack is tension and conflict. In both books, I found myself not caring about the characters. I think that the thing that kept me reading was I found Wynn's ideas about child-rearing interesting. But that is not a good reason to read a book. I also kept getting tripped up over Katherine’s nickname, K.O. I kept thinking about boxing. I will be hard pressed to pick up another book from Debbie Macomber.